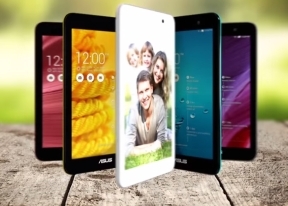 The Asus Memo Pad 7 ME176C comes with a custom Gallery app. It defaults to a view of your camera roll with thumbnails at the top that change the view to your other albums. You can't resize the image thumbnails like on other launchers from Sony and Samsung. The integrated editor offers various effects, frames, tools (crop, mirror, straighten, rotate, fisheye, doodle) plus light adjustments that let you bring out the shadows or the highlights. A nifty feature lets you drag a vertical separator between your edits, so you can see before/after effects side-by-side. The Memo Pad 7s video player has a very basic interface with none of the nifty extras like subtitle support, equalizers, or playback speed that you'll find on more mainstream launchers. It features just a playback scrubber and a play/pause button, alongside a sharing button at the top. It was able to play most of the standard formats including AVI and MKV files, but does not support WMV files, or videos coded with the AC3 audio codec. There is also no support for files with the AAC audio and AVC video combo, although separately they play when paired with other codecs. The Asus music player does decently in terms of functionality, covering all the basics. It has a large Now Playing window with prominent album art, and also has integrated bass boost and surround sound options, although both of those only work with headphones. A system-wide equalizer is also available, but is accessed from the notification area toggles rather than the music player itself. You can also sync Cloud services like Google Drive to stream your music collection without having to transfer it to the tablet, and you can also playback from local media servers. 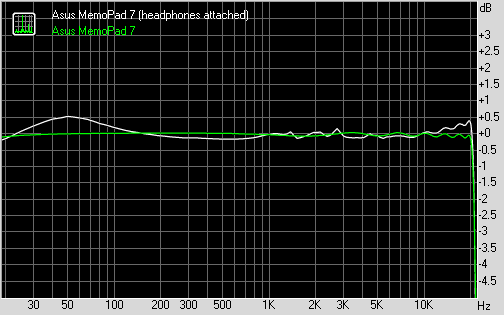 We ran our traditional loudspeaker test on the Asus Memo Pad 7 ME176C and it proved to be a very poor performer. The solitary speaker on the back was not enough to produce adequate sound, and it earned a score of Below Average in our testing. When connected to an active external amplifier the Asus MediaPad 7 audio output is decent with high volume levels and little to no artifacts. The scores the tablet posted in our test are pretty high across the board as befits a device of this size. Plug in a pair of headphones however and things quickly start to go south. Stereo crosstalk spikes and the stereo quality drops to mediocre levels, while intermodulation distortion is well above the average. Volume levels drop significantly too, adding up to a rather disappointing showing in this test. The overall output isn't disastrous and we know this is an entry-level device that we have on our hands here, but we are really used to seeing better from tablets so mediocre is best we can call this.